Quality versus quantity – the classical confrontation. You also find it within research on solar cell materials and the two main ways of producing silicon for solar cells, but the heart of the matter is the quest to produce a perfect crystal. Let’s be unoriginal and begin this post using the starting sentence of 99% of the papers in the field: Silicon-based solar cells constitute more than 90% of the global photovoltaic market. For the newbs, Wikipedia (our bible) defines today the photovoltaic effect as being the creation of a voltage in a material, upon exposure to light. Tomorrow’s definition may be different, but I guess it is a simple/efficient way of defining the phenomena. The complete silicon solar cell production is divided in multiple steps. The forming of crystalline silicon ingots lies in the middle of the value chain, and is a critical step to achieve good quality solar cells. The ingots are formed by crystallization from the melt, and are either mono- or multicrystalline. This blog-post will be focusing on crystalline silicon for photovoltaic, and will attempt on drawing a simple comparison between the two main material categories, mono- and multicrystalline silicon. I am aware that this is not the catchiest introduction… but please continue reading, this is more exciting than it sounds, I promise! 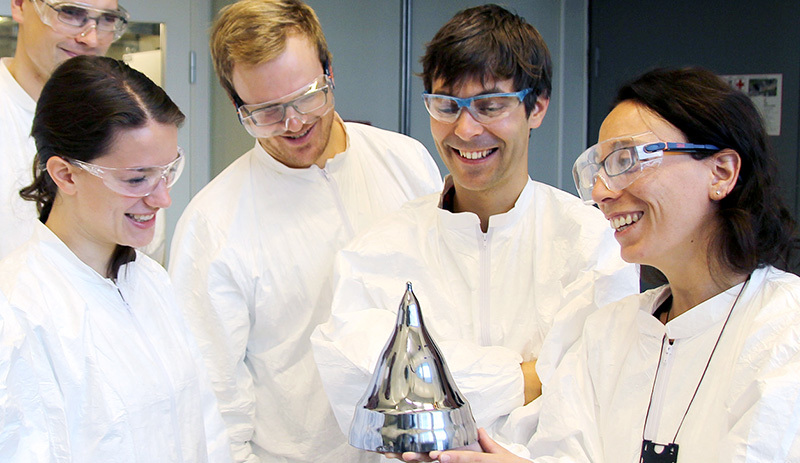 The brightest minds of the solidification group work at the Department of Material Science of NTNU to improve the quality of silicon ingots. Whether mono- or multicrystalline: The challenge is to grow prefect crystals, containing as few irregularities as possible. The irregularities, or defects, lead to a drastic decrease of the output solar cell efficiency. Multicrystalline silicon ingots are produced by directional solidification in crucibles made of silica, and can weigh up to 2 tons. They contain a wide variety of imperfections, reducing their quality. They are however relatively cheap to produce as the average multicrystalline silicon wafer price is around 1.0 $. These ingots have in addition a great improvement potential. Today’s production of silicon for solar cells is approximately 50% multicrystalline, and this ratio tends to increase over the years. Due to the relative low quality of the material, the production costs determine the market shares, and China dominates outrageously the competition, as almost no multicrystalline ingots are solidified in Europe or US anymore. Monocrystalline silicon is mainly solidified using a method that has taken the name of its Polish inventor, Czochralski. This process is relatively more expensive (wafer price around 1.2 $); when successful, it leads to the production of cylindrical ingots up to 150kg. Gaute Stokkan is a researcher at SINTEF, and has recently described these “sausage formed” ingots in Aftenposten, as being the most perfect thing humans have created. 4 billions of atoms arranged regularly in rows, with the same constant pattern and the same distance between each others. Improving the monocrystalline ingots quality certainly is a challenge! The moral is however high, and many researchers are still focused on eliminating the last remaining imperfections. This high quality material represents a market niche for the countries where production costs are more important. Norway has in particular built a solid competence in Czochralski-silicon over the years, and two monocrystalline silicon solidification plants are found in the country, one in Glomfjord (Norwegian Crystals), and one in Årdal (NorSun). … this is one of these confrontations. Both mono- and multicrystalline materials have their arguments, and are associated with different technological challenges and scientific problematics. God knows what the future will be (pardon my religious tone here), but one thing is clear: the current situation certainly ensures a long life to research in the field of silicon solidification!